As often as I do/work trackdays, fact is, it can be a few weeks in between them. What this usually means for me is that it takes me a number of laps, maybe a couple of sessions or so to get up to speed out on the track, picking up where I last left off. 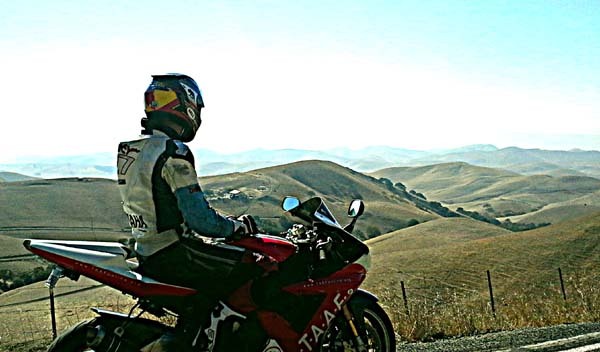 As much street riding I do, whether commuting or weekend jaunts, it doesn't really help hold me over in between trackdays, since my street riding is a far cry from my track riding; I don't ride the street like the track, and vice versa. No matter. I don't mind the first few laps or sessions to get back up to speed. It's a necessary evil. When I finally do get up to speed though, it usually creeps up on me in the sense that it just happens. But there is usually a giveaway, and that's my knee dragging. There isn't a right or wrong way to position your body on the bike (for the most part). The first and foremost rule is that you be comfortable on top of your bike, and moving on and off it. 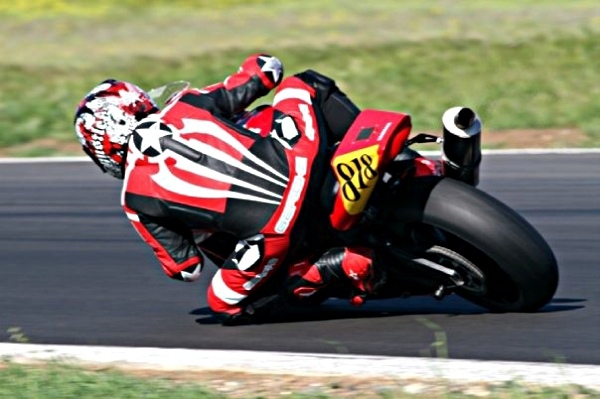 My body position (BP) on my bike doesn't usually find me dragging knee through corners; I can go through a whole day of track riding without dragging my knees. When my knees do touch the pavement though, then I know I've started to go faster, picking up the pace, and getting that much closer to my limit. 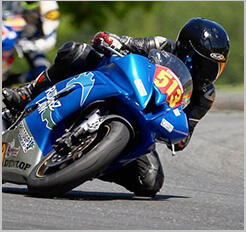 This is the main purpose of my BP – to actually utilize my knees as a gauge for my pace, and thus the limit. Dragging knee through a corner or two isn't usually a sign that I've picked up the pace, only perhaps through those corners. But during a session when I find myself dragging knee corner after corner, then that's when I know. So I pull into the paddock immediately. I need to take a breath. I need to collect myself even during the times when I'm at my best, when I've got it going good. I want to make sure that I take the upward trend that I find myself in, take that momentum and build from it rather than crash and burn (so to speak). Another of my survival instincts? I've been riding on a wave of highs lately in and out of motorcycling, and it's been awhile since I've had a windfall that's blown for this long. So much so that I'm left a bit not knowing what to do with this good fortune, where to go from here, or simply where to begin to continue with this momentum. So I feel it apt to take a breather, to remember where I've been before getting here, to help me best figure out where to go moving forward. Figure out how to build from here. The thing with feeling like you're on top of the world is that the stakes are higher. If you lose focus and get caught up in the fun of it all, you could be looking at a very long way down from where you are.